Produced in 1982 with the War Zone Tour Committee, War Zone was Red Star’s second documentary for CND. 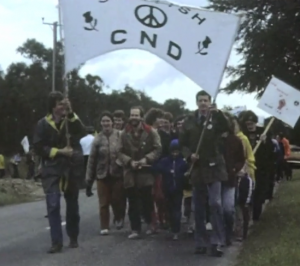 It follows two women cyclists linking together the CND groups around Scotland. Each group tells its story of living and campaigning alongside the US and NATO bases strewn throughout the landscape. Red Star was established in 1979 to provide newsreel coverage of demonstrations and activities supported by the labour movement and trade unions in Central Scotland. These short newsreels were screened at the Netherbow in Edinburgh alongside full length feature films hired from the Other Cinema such as Battleship Potemkin and Battle of Algiers. Red Star’s films were toured and discussions arranged through the Workers’ Education Association, with a screening and discussion at Newbattle Abbey College of Deadmen Echo, Red Star’s film on the workers’ film movement of the 1930s. The Red Star Archive can be found on www.summerhall.tv.